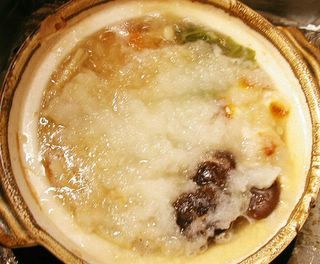 “Mizore” means sleet, and mizore nabe is a nabe dish with grated daikon on top. Pretty healthy dish. Recipe…..sorry, I didn’t measure anything. I just put Kombu (kelp) in water and heated it, added a little sake, soy sauce and mirin, then threw in the ingredients. My special chicken meatballs were lightly seasoned with salt, pepper, sake and soy sauce. 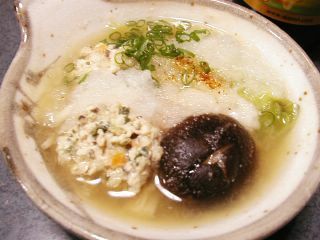 I scooped the meat mixture with a spoon and dropped in boiling dashi. 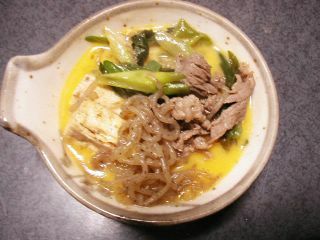 When everyting was done, topped with grated daikon ( see the photo on top) and simmered some more. 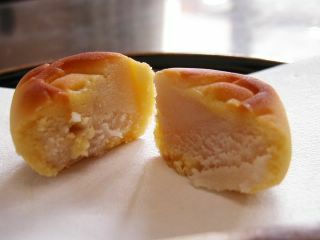 Oh, I browned the mochi (rice cakes…leftover again) in oven toaster beforehand. Served with shichimi pepper and yuzu-ponzu. 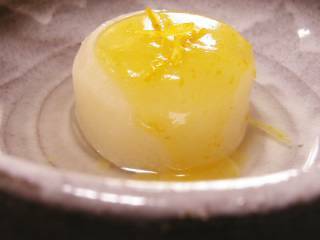 Every year, after the New Year’s holidays, some TV cooking shows and cooking magazines feature “some ideas for eating up leftover mochi (rice cakes).” I’ve been exploring a bit this month and here’s two ideas (from a Japanese website) that I tried out yesterday. Easy dish. 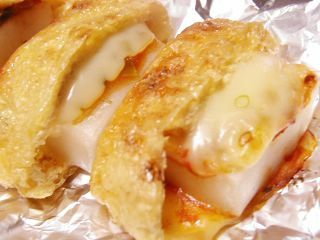 All you have to do is put mochi, sliced cheese, pizza sauce, minced scallion in aburage pouch and bake in toaster oven. 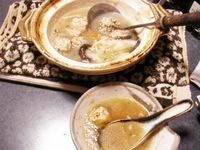 Aburage needs to be boiled in hot water briefly beforehand to remove excess oil. 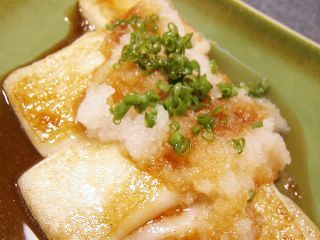 Fry sliced mochi with butter in a frying pan and pour a little amount of soy sauce over it. 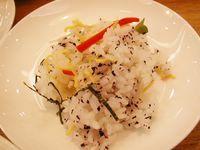 Place on a plate and top with grated daikon radish and minced scallion. Pour ponzu all over. Not bad, but I need a twist…maybe shichimi pepper and sudachi or yuzu squeeze or something like that. 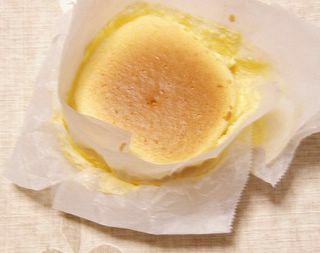 My 1st attempt with Rachel's "Fuwa Fuwa Soy Milk Cakey"
Here’s my another “not-so-good-looking-but-tasting-OK” stuff. 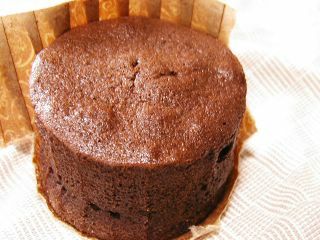 This was my first attempt with Rachel’s Fuwa Fuwa SoyMilk Cakey. Yes, this is the first one, and there’ll be 2nd and 3rd attempts to come for sure. My mistake this time was making the paper collar too high for my oven… I had no idea how much the cake would rise, plus… no, the truth is, I just got lazy. I didn’t feel like cutting it down to a proper size. So I guess the collar kept blocking the heat while baking. It took so long for the cake to get done, and before it looked properly set, the top started turning really brown. I put aluminum foil on top and almost doubled the overall baking time. Next time, I’ll make the paper collar properly and adjust the oven temperature/baking time a bit. 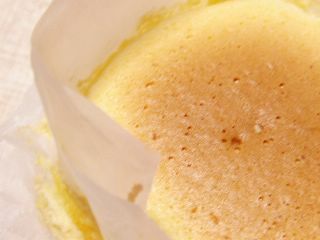 I’m impressed with the idea of using wet kitchen cloths for baking, BTW. Anyway, so happy that I came across with her site! When I read this post by chika and saw all those “new” and/or “limited-edition” stuff, I ended up leaving a whiney comment. It’s one sad thing about living in a very small town in Japan f-a-r away from big cities. Often we can’t find such “special” ones in nearby supermarkets. I got particularly interested in the Pistachio Look chocolate in her post, and when I dropped by a supermarket on my way back from work, I looked for one. .....Just disappointment…. though I had expected that. 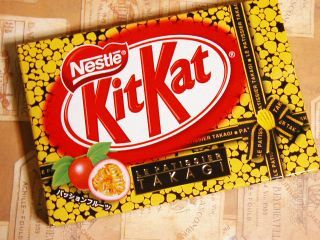 This is a passion-fruit flavored Kit Kat, named “Kit Kat ‘Takagi-original’ .” Looks like it was an invention by some famous patissier called Mr. Takagi. 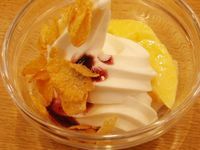 The combination of slightly sour passion fruit flavor and sweet chocolate was interesting. Not quite perfect, but pretty yummicious!! I'm no great baker, but this time I liked what I made. 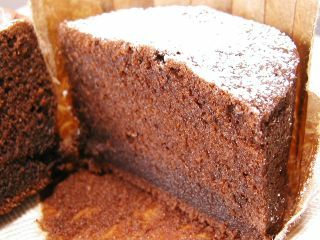 MrsTweety’s comment the other day somewhat triggered my chocolate cake craving, and I spent some time googling for a recipe of gooey chocolate cake. But there were just too many and when I picked one recipe site, I had no energy left to beat eggs to bake a cake. So I went for something quicker and easier…. Chocolate muffins. 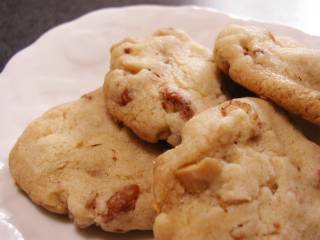 I used this recipe, but without chocolate chips because I didn’t have any. 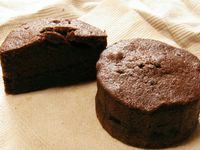 And I thought it was better without them to enjoy the soft and rich texture of the muffins. 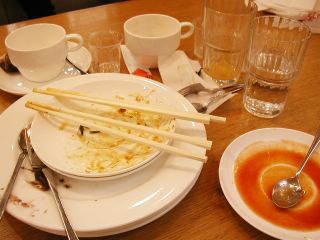 No, more than that… They were yummicious! Last week was a real eventful one! I had loads of fun, but also got frozen many times, going out a lot. Now I need a hot, nutritious dish to recharge myself!! No doubt about it!! 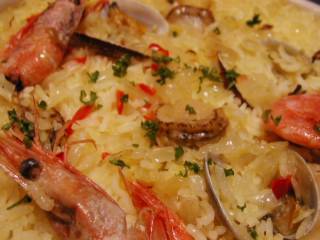 Instead, my family loves to put an unusual ingredient in this tasty dish. 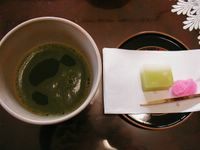 It’s called ita-fu, which is basically thin strips of dried wheat gluten cakes. 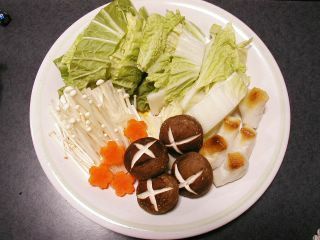 You soak them in water until soft, then boil them in Sukiyaki soup with other ingredients. 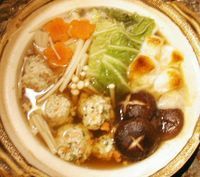 The ita-fu strips absorb the soup more than anything else and get sooooooooo juicy and yummy. Mmmmmm!! My favorite! But this time I couldn’t find them at the supermarket. Sigh. 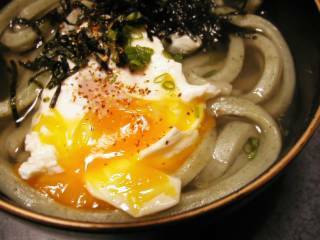 While you wait for this delicious dish to be ready, you have a work to do… you need to beat the raw egg in the serving bowl. The raw egg is an optional thing and I didn’t like it when I was a kid. 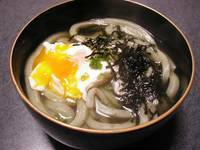 But later I learned that the raw egg makes the sweet’n salty Sukiyaki soup somewhat milder and the combination is quite good. 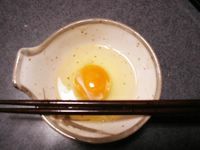 Now I never eat Sukiyaki without a raw egg. 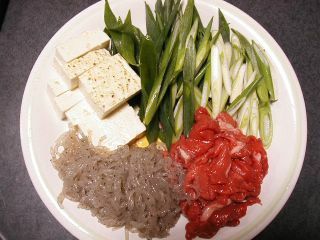 Anyway, good and hot Sukiyaki, accompanied by warm sake, surely warms you up on a freezing winter day. 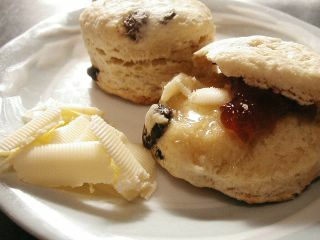 These scones turned out just a little harder than I expected (maybe I overdid the dough), but still tasted pretty good. Yummy with tea. Next time I want to try cheese and herb scones. 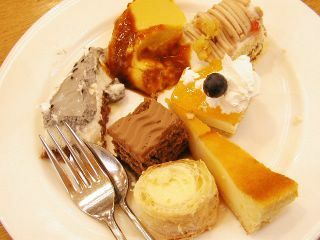 Maybe some of you have been to fish fish’s blog already and found out we went to a cake buffet together last Sunday in Osaka ; ) It was so much fun, and so much food!! 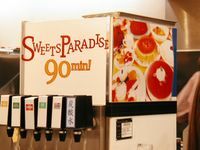 This is the name of the place: "Sweet Paradise 90 min!" 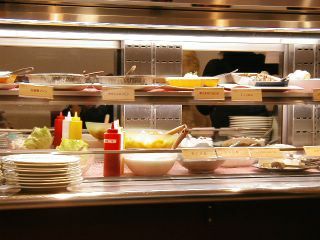 with all-you-can-eat for 1260 yen for 90 min! Fish fish took more photos that show what this place was like. This is not what a restaurant does for certain time of the day only. To me it looked more like a fast-food shop. First, we were told to buy tickets from the vending machine in the waiting area. What tickled me was that the machine had a button to issue “ryoshusho” (voucher). I wondered if anyone would try to have it paid as a business expense. Mmmmm, maybe young office ladies on a business trip? I just had to jump on cakes before anything. 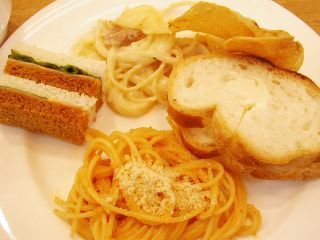 Then at the end of the pastry section, I found some savory foods were served, such as sandwitches, spaghetti and soups. I decided to come back for them on my 2nd round. 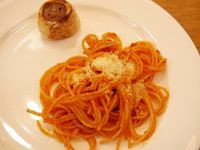 These were tuna cream spaghetti and Japanese-style (maybe mentaiko?) spaghetti. 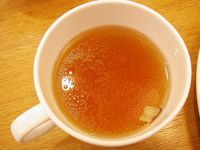 Ginger soup. They also had corn cream soup. 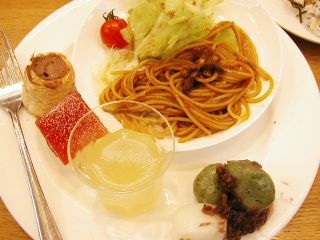 Curry- flavored spaghetti, salad, and some sweets, including Japanese dango (dumplings) with anko(sweet red-soybean paste)! OMG, they have chirashizushi, too! At a cake buffet!!! Can you believe that? And ice cream topped with blueberry sauce + cornflakes and custard pudding. Of course, there’s always a special place for ice cream, you know. After the cake buffet, fish fish and I went to Karaoke to consume some calories ;) It was another nice place with incredibly low price! Fish fish is a good singer. I was impressed. She also helped me find a Chinese song that I had been looking for. When I was in the U.S., a Chinese friend of mine recorded the song on a cassette tape and made photocopy of the lyrics for me, but the sound and the photocopy were not very clear. Then I misplaced the tape after coming back to Japan. Since then I’ve been wanting to find this song, but didn’t know the title. When I sang just a little part of the song, fish fish found it for me in the Karaoke book right away. Just like that! I’ve never dreamt of encountering this song again, and singing it again at a Karaoke place in Japan with a blogger friend!! Life is so interesting, isn't it?! Thanks a mil., fish fish :D You're a wonderful person! I always overdo the mixing, and mom laughs. Another long-term experiment of mine: savory cheese shortbread. As in the title, the result I got today was hmmmm….getting closer, but not quite there yet….. I tried a recipe someone posted to some kind of food forum, but I had to replace the cheese called for in the recipe with some cheap grated cheese that is popular around here. I guess that made a big difference in the direction of worse (both taste- and texture-wise). I’ll need to look for real cheddar cheese. 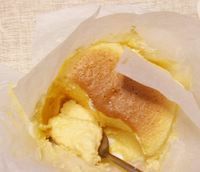 Anyway, I’m going to make hot, sweetened milk tea for this not-so-great cheese shortbread today. 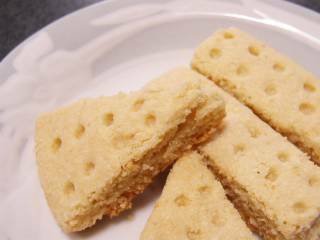 Does anyone have a good recipe of cheese (not blue cheese) shortbread? Not a spicy kind. Something like Walkers’. Today was my first complete day off since January 3rd. I thought about cooking or baking something, but ended up just goofing off. Yes, again. Forgive me, almost everything I had today was “just-heat-it-up-and-eat” stuff. This yomogi (Japanese mugwort) udon caught my eyes when I was aimlessly wandering around in the supermarket. Its green color looked so healthy. 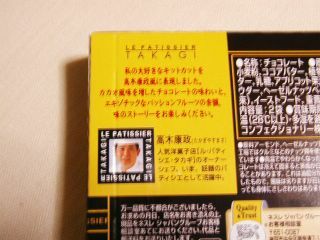 But when I tried it in “instant” soup, it was nothing but just disappointing…there was almost no yomogi flavor at all. The egg was good, though. It tasted good. (I mean, how can you fail when all you have to do is just add certain amount of boiling water?) I guess I’m going to eat some tangerine oranges to take VC and go to bed early tonight. I was up until 4:30am this morning, so my energy level was rather low all day…. Night-night! A quick & easy soup for a cold winter day like today. It's so windy outside. “Simple is best.” That’s probably the phrase that best describes this dish. 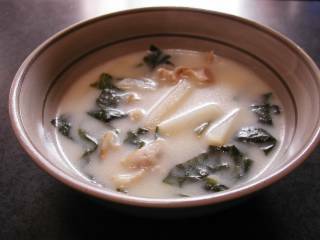 Furofuki-daikon is a typical Japanese simmered dish for winter. I brought back 2 daikon radishes from my parents’ veg. garden about a week ago. Some days passed while I couldn’t quite decide what to make out of them. Then I finally decided to give this a try. 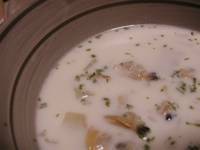 There seem to be several different versions of Furofuki daikon recipe, and I decided to try the one that called for the simplest seasoning, which is, simmering daikon with kelp, water and sake only. No dashi stock, no soy sauce. Just the flavor from the kelp. Since I’m so used to using my favorite liquid dashi concentrate, I wanted to try and see how such simple seasoning would turn out. Then make a deep crisscross in one side which should be the bottom when served. Boil them in rise rinsing water for apx. 20 min. Drain and wash with cold water quickly. 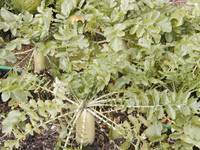 Put daikon (cut side down) and a sheet of kelp in a pot and add plenty of water to cover the daikon completely. 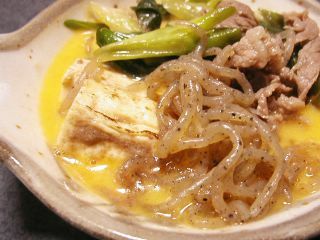 Bring to boil on high heat and then simmer over low heat until daikon is transparent and soft. 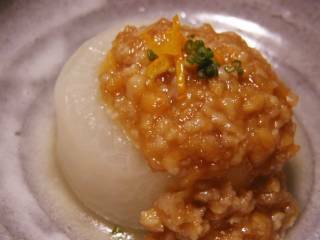 I tried 2 kinds of miso toppings this time: Yuzu miso and Tori-soboro (ground chicken) miso. I started with the recipe I found on a Japanese site, but ended up making many changes to the original recipe, so I don’t remember exactly how much of each ingredient I actually used. 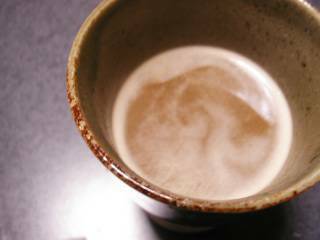 Cook miso, sugar and mirin in a saucepan over low heat stirring constantly until smooth. 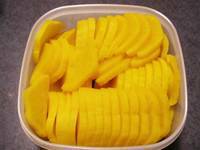 Remove from heat and add yuzu rind and juice. Stir well. Sautee ground chicken with salad oil and set aside. 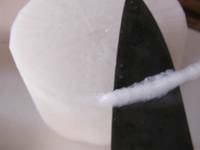 Cook all other ingredients in a saucepan over low heat stirring constantly until smooth. Add the sauteed ground chicken and stir well. Remove from heat. The taste? ---- * Good* ---- Almost divine. I used a little expensive kelp this time because I thought it was the key in this simple seasoning. 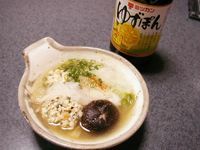 If seasoned strongly with soy sauce and dashi, it couldn't have brought out the best of the flavor of the miso toppings, I suppose. BTW, I didn’t waste anything. 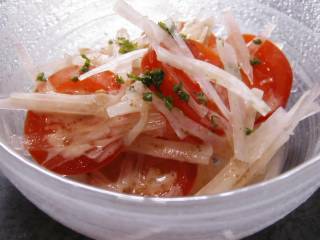 The tiny daikon shreds from mentori were mixed in this. So it was a pretty daikon-ful day today. And tomorrow will be, too. This post by Reid of Ono Kine Grindz was almost shocking to me. Arare in cookies! Absolutely unbelievable combination! I thought, at first. But then I thought, “Hmmmm, wait, maybe not.” Like he commented, the soy-sauce flavor and crunchiness of arare must be good in sweet cookie dough. Gee, I gotta give it a try! And the result is the yummy-looking photo on top. 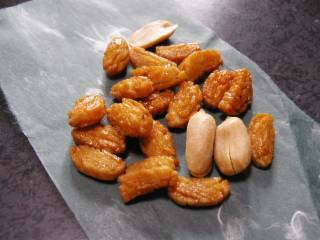 I used these peanuts arare from the 100-yen section of a nearby supermarket. I broke them into smaller pieces before throwing into the dough. I also chopped the peanuts and added to the last half of the batch. They are sooooooooooo good! The arare are much crunchier than I expected. 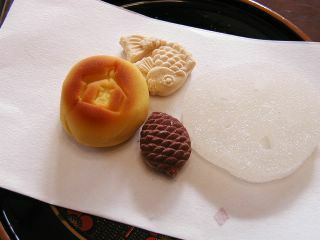 And indeed, the combination of the sweet cookie and soy-sauce flaver is definitely 2 thumbs up! Thanks Reid! You sure have a creative mind. 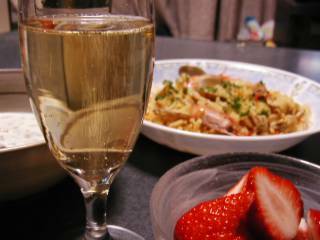 My dinner tonight: Seafood Paella, Clam Chowder and Champagne with Strawberries! When I visited my parents’ for the New Year’s days, I scrounged around in the kitchen and brought back some foods, liquor, seasoning materials and coffee. Among them was, believe it or not, a bottle of champagne!! 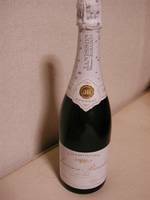 (Actually it was an end-of-year gift that my aunt received from someone, with 2 bottles of wine, but she doesn’t drink so she left them at my parents’ house for me to take.) Today, I decided to open it and celebrate. 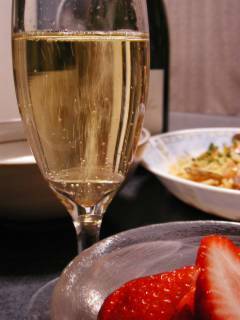 What was magnificent was the combination of the champagne and strawberries! !